July 22-24 2016 10 hours. Participants learn the basics of blacksmithing, the nature of fire, how to care for the fire, use of the anvil and the blacksmith‘s tools. They find out how to work with glowing iron or steel to create unique pieces and make e.g. hooks, candlesticks, spikes (nails) and various other small items. 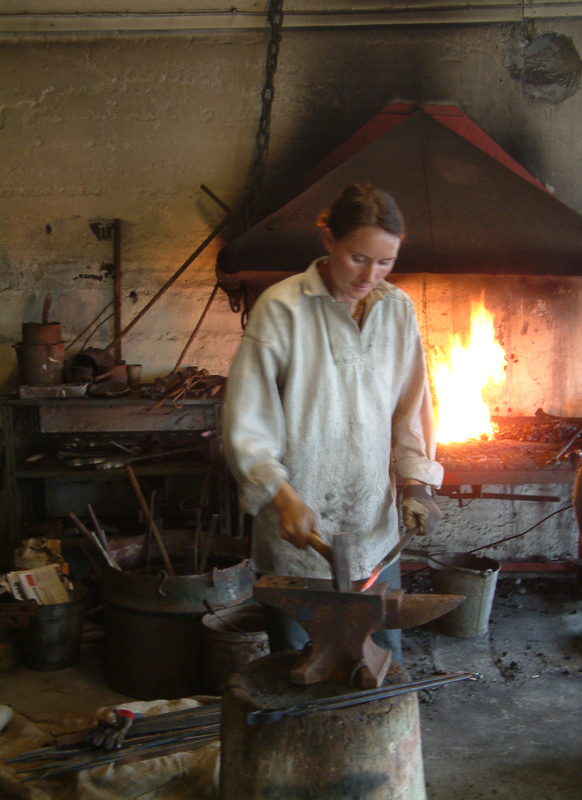 Experienced blacksmiths can also practice and recieve guidance from Beate concerning more complicated items. Beate is an experienced teacher. She has won many competitions, is the Nordic Champion of Blacksmithing and multiple Icelandic Champion. She has taught and exhibited widely and operates her own blacksmith workshop at Kristnes in Eyjafjörður. Price kr. 20.000.- all material included. 25% discount for children younger than 18 accompanied by adult. Starts 1 pm, Friday July 22 at The Technical Museum, Seyðisfjörður. Registration at the bottom of this page www.tekmus.is , tekmus@tekmus.is or telephone +354 4721696. July 22.-24. 2016. 14 hours. Participants become acquainted with various types of print media and produce bookart together. Letterpress tools and materials will be put to use. Freestyle printing methods will be applied and students will also be allowed to use old clichés from the museum‘s collection. Various types of bookbinding will be introduced and a joint bookart piece will be produced from text and/or illustrations chosen by the group in sufficient edition size for all participants. Price kr. 26.000.- all material included. 25% discount for children younger than 18 accompanied by adult. Starts 1 pm, Friday July 22 at The Technical Museum, Seyðisfjörður. Bjarni Þór Kristjánsson July 23 2016 4 hours. Participants learn the basics of whittling birds from wood, e.g. plover, raven, oystercatcher and redwing. Bjarni will demonstrate how to make swan with the fish-bone method. Open to all. Price 5,000 kr. Bjarni Þór Kristjánsson was born at Seltjarnarnes 1954 and grew up in an athmosphere of handcrafting. He has been whittling as long as he can remember. Bjarni teaches in elementary schools and is a popular figure within the arena of traditional handcrafting in Iceland. 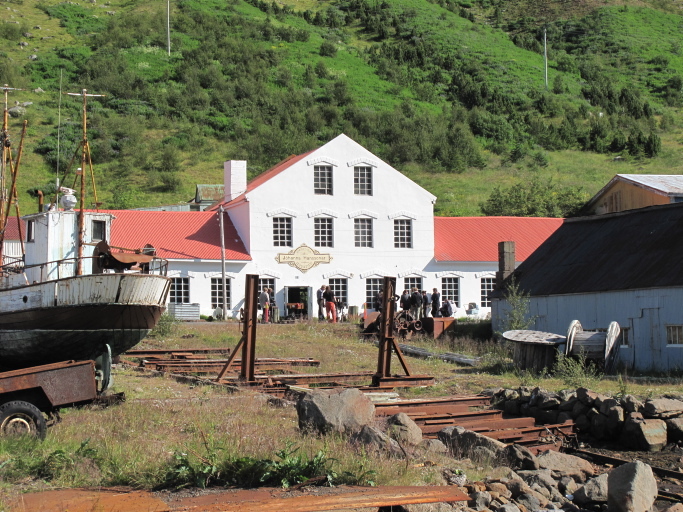 The Whittling course 2 begins at 1 pm Saturday 23 july in The Technical Museum, Seyðisfjörður. FRIDAY JULY 22. 3 hours and SATURDAY JULY 23. 2016 3 hours. 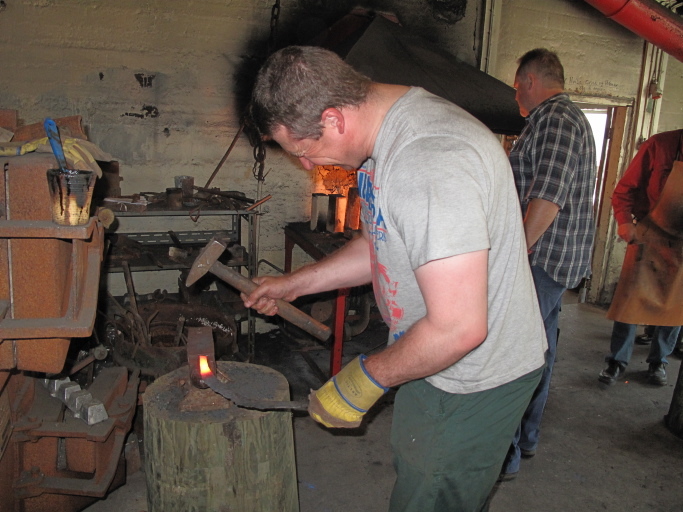 Participants are introduced to the basics of blacksmithing, the nature of fire, how to care for the fire, use of the anvil and the blacksmith‘s tools. They try working glowing iron or steel and make a few pieces, e.g. hooks and spike (nails). Middle-age viking type forge will be used – bellows and all. Price 6.000.- krónur. all material included. 25% discount for children younger than 18 accompanied by adult.Allt efni innifalið. 25% afsláttur fyrir yngri en átjan ára í fylgd fullorðinna. Both courses are the same but on different days. Mini-course 1 begins Friday 22 July at 3 pm and Mini-course 2 begins Saturday July 23 July at 9 am. Guðmundur Sigurðsson July 22.-24. 2016 10 hours. Participants learn the basics of metalcasting and making casting moulds. They will melt metals and cast pieces from tin and bronze. It is possible for participants to cast replicas of small things they bring themselves (or find). Guðmundur is an accomplished teacher and supervises the magnificent Blacksmith forge in Akranes Museum. He has organized the Icelandic Blacksmith Championship Competition for years. Price 20.000.- krónur all material included. 25% discount for children younger than 18 accompanied by adult. Starts 1 pm, Friday July 22 at The Technical Museum, Seyðisfjörður. Páll Kristjánsson (Palli the knifemaker) July 22-24 2016 12 hours. Participants leave with a knife that has a new handmade handle and rests in a handmade leather sheath. Palli the knifemaker has been making beautiful knives for decades and his products are highly valued. More information about Palli on his website. Price kr. 20.000.- all material included. 25% discount for children younger than 18 accompanied by adult. Starts 1 pm, Friday July 22 at The Technical Museum, Seyðisfjörður. Jón Þóroddur Jónsson, call sign TF3JA July 22-24 2016 6 hours. Participants learn about the basics of Morse communication and make their own functioning morse key with sounder. Fun for all age groups. Price 3.000. krónur- all material included. course begins at 1 pm Friday July 22 at The Technical Museum, Seyðisfjörður. SATURDAY JULY 23 2016 90 mín. & / SUNDAY JULY 24 2016 90 mín. For everyone 6 years and up. Cyanotype is one of the oldest photo techniques, safe and easy. Participents can bring their own printed photo og use plants, cut-outs and lots of other things to make beautiful photos. Price 1000.- All material included. Both courses are the same but on different days. 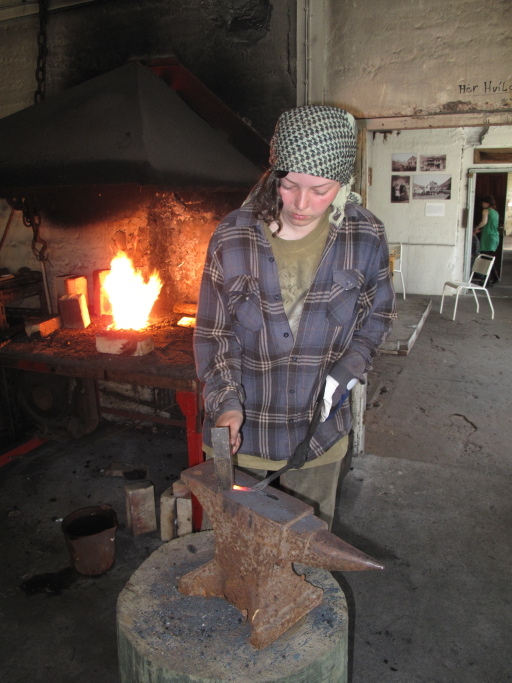 Blacksmithing – basic course - Teacher: Beate á Kristnesi July 22-24 2016 10 hours. 20.000 kr.